This Friday, we will play with three bands in just one evening: EAR, Rollover and The Tesla Valley Farmers live at Kulturhaus GUGG in Braunau am Inn. This will be the first Rollover show in more than seven years, and we will also celebrate the release of Raphael’s latest album production Cucumber Radio with The Tesla Valley Farmers. There are only a few tickets left, so hurry up and reserve your seats! 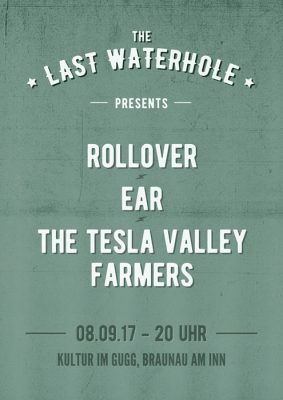 08.09.17 EAR, The Tesla Valley Farmers & Rollover in Braunau am Inn at GUGG.